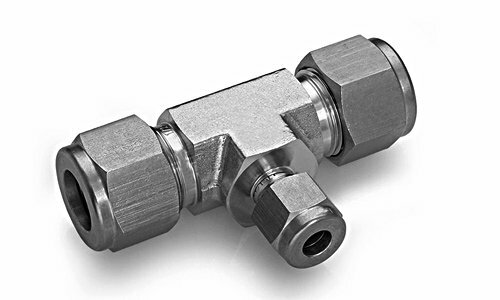 A 316 Stainless Steel Reducing Union Tee, 3/8" Tube Fitting x 3/8" Tube Fitting x 1/4" Tube Fitting Duolok Vs. Swagelok ® Comparison Design SSP Duolok tube fittings are designed and manufactured to provide a reliable, leak-proof connection in instrumentation and process tubing systems. The double ferrule design compensates for the variations in tubing materials, hardness, and thickness of the tube wall to provide leak-tight connections in an extensive range of applications. Quality All SSP Duolok fittings are manufactured in the USA and are quality controlled with an ISO 9001:2000 quality management system. Packaging SSP Duolok tube fittings are individually bagged to assure the highest levels of quality, safety and cleanliness. Materials 316 Stainless Steel - SSP Duolok straight configuration tube fittings are machined from type 316 stainless steel cold-finished bar stock in accordance with ASTM A-276 and ASTM A-479. Shaped bodies are machined from close-grained 316 forgings in accordance with ASTM A-182. All 316 stainless steel SSP Duolok components are heat code traceable with CMTRs available. Interchangeability SSP Duolok fittings are 100% interchangeable with Swagelok® brand of tube fittings. SSP Duolok and Swagelok® brand of tube fittings are also 100% component intermixable. Swagelok® is a registered trademark of the Swagelok Co. If you have any questions about this product by Duolok, contact us by completing and submitting the form below. If you are looking for a specif part number, please include it with your message.